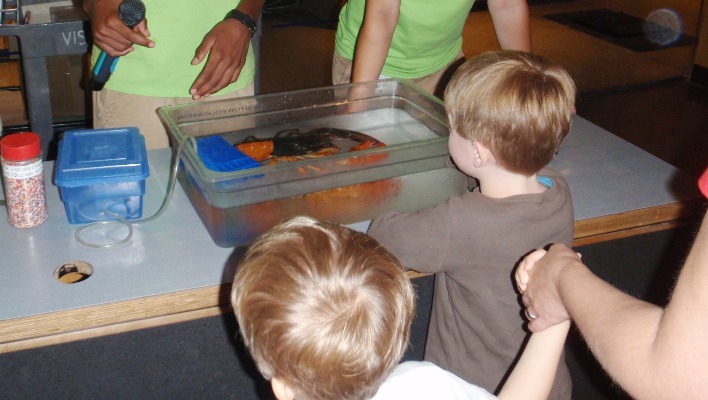 One way that visitors can get up close and personal with an Aquarium animal is to attend a Live Animal Presentation—or as we educators abbreviate it to, a LAP. Interpreters bring an animal from behind the scenes, showcasing that animal during a formal talk. A myriad of animals get their moment in the spotlight-anything from jellies, horseshoe crabs, turtles, toads and snakes! An animal that is featured a lot during these presentations is one that is close to the New England psyche: the North American lobster! In Visitor Education jargon, that’s a LOB. This animal, common to many seaside restaurants, is also a common exhibit animal throughout the Aquarium and is one that visitors like to see up close. 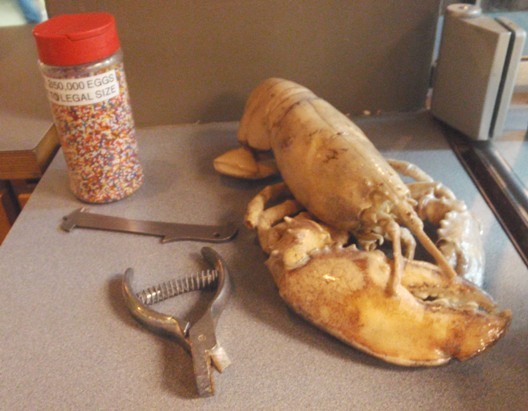 It does take a little bit of preparation to get the lobster ready to go! 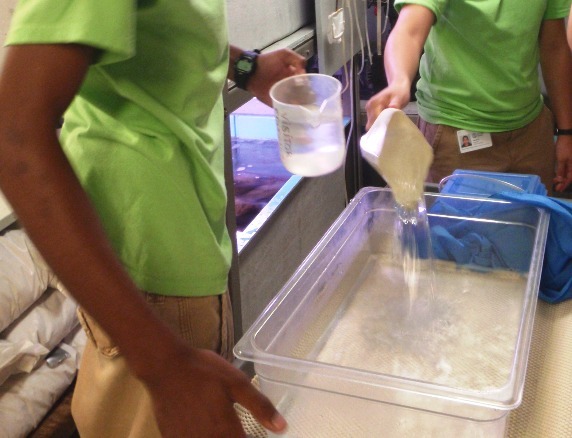 Most of our live animal presentation animals are kept behind the scenes. Once the interpreters are in the area, they need to prepare the holding container that the animal will be shown in. For the lobsters, that involves cold water, ice packs and an aerator to keep oxygen amounts at peak levels! Once the container is set; it’s an elevator ride downstairs to the main stage and then show time for both the lobster and the educators! The particular lobster the educators brought out for this presentation is a fan favorite; can you guess why? LAP lobster for the day-cool colors! 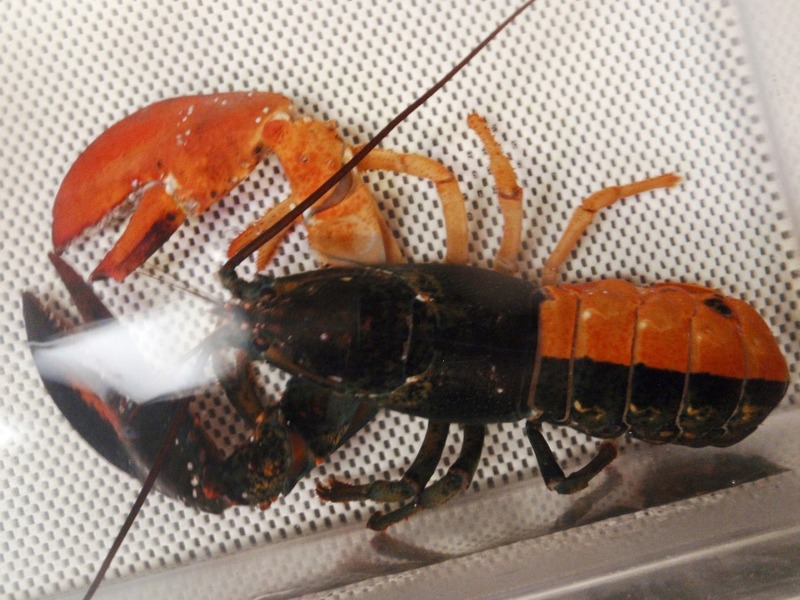 Visitors are completely blown away by this lobster’s unique coloration! Lobsters get their shell color from their diet and their genetics; this one has particularly unique DNA that causes its shell to be two different colors split right down the middle! It’s a pretty special lobster and one that visitors can only see during a LAP. In addition to the lobster, the educators bring down some biofacts or tools that are used in the lobster industry. Tools of the trade-the LAP trade! Visitors are allowed to touch them, pick them up and take pictures with them. 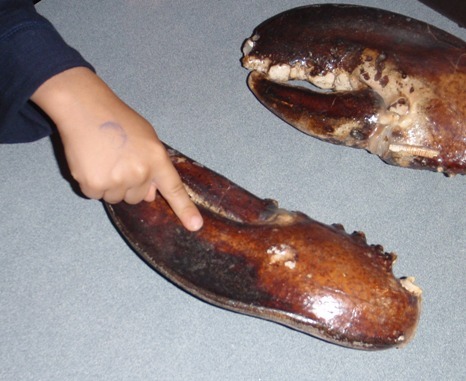 When was the last time you were able to touch a pair of 19 pound lobster claws? So next time you are at the Aquarium, check out the daily schedule to see when the next LAP is happening. It may or may not be the lobster featured today, but it will be always be a neat experience to be that up close to one of our Aquarium animals! Any questions? 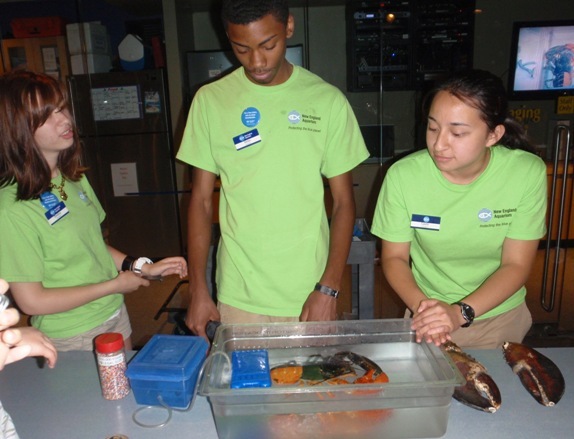 Meet us in the Blue Planet Action Center, we'll be happy to answer your questions about our amazing live animals! 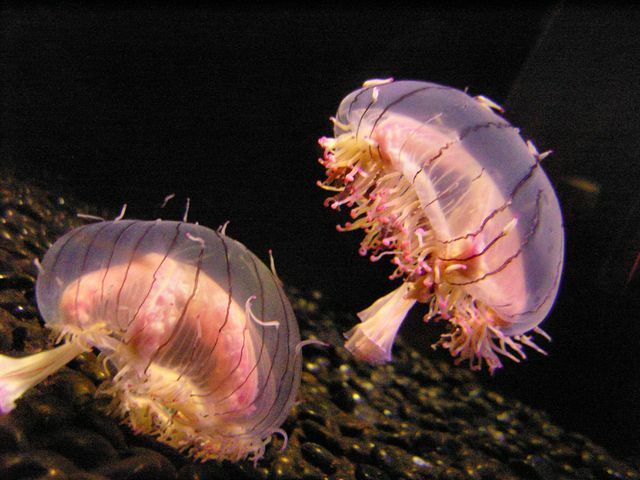 Jellies are found in a number of areas around the Aquarium. You can find them on both floors of the West Wing (the same area where you can find our new Trust Family Foundation Shark and Ray Touch Tank), in a number of behind-the-scenes areas and also on the second floor in the Thinking Gallery. While the species on display are known to change, we currently have a beautiful species known as flower hat jellies (Olindias formosa). These intricate animals are found naturally off the coast of Southern Japan, Brazil and Argentina. They are thought to be quite rare, but their conservation status is not currently known. While they don’t move around that often, they certainly can. Like all true jellies, or cnidarians, they have stinging cells called nematocysts. A flower hat jellies’ sting is painful, but is usually non-lethal to humans. You can read more about jellies on a previous post. These jellies eat mainly small fish and crustaceans. Here at the Aquarium they are fed live zebrafish. There is no set feeding schedule, so getting to see them fed is just luck of the draw (as a hint, they are at varying times on Saturday, Tuesday and Thursday). It’s a pretty interesting feed. Check out the video below to see how it works! See you in the galleries! It's a bird! It's a plane! It's a... whale?! As you walk up the ramp from the Thinking Gallery on the second floor to the Rivers of the Americas Gallery on the third floor, you may notice a huge structure hanging above your head. 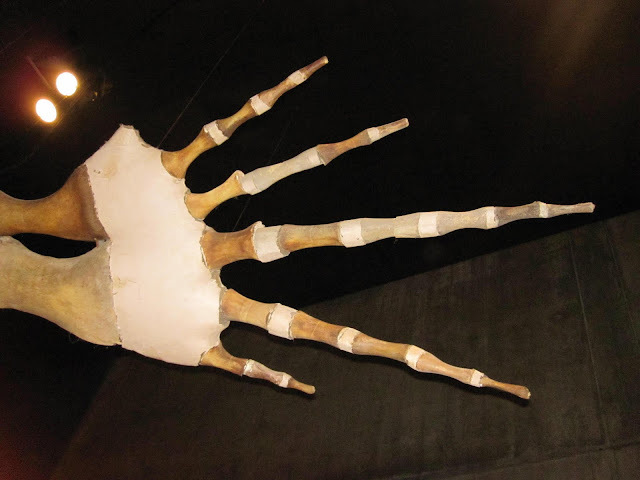 It may look like a dinosaur skeleton, but it is actually the (not quite complete – more on that later) skeleton of a North Atlantic right whale. If you follow the Right Whale Research Blog you’ll already know a lot of about these incredible, but unfortunately critically endangered, animals. 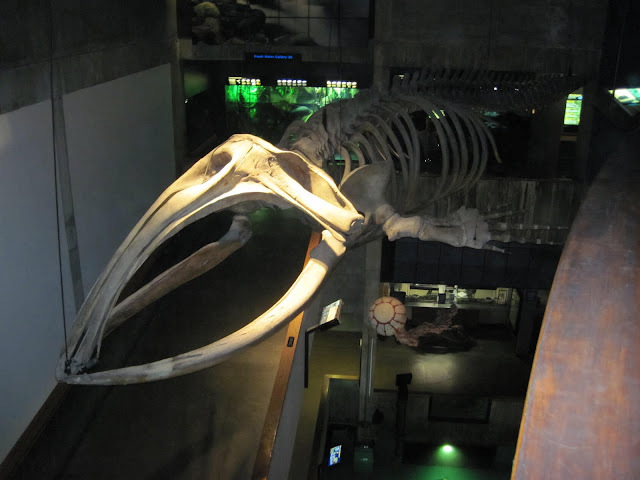 A 35-foot North Atlantic right whale skeleton hangs suspended above the walkway. 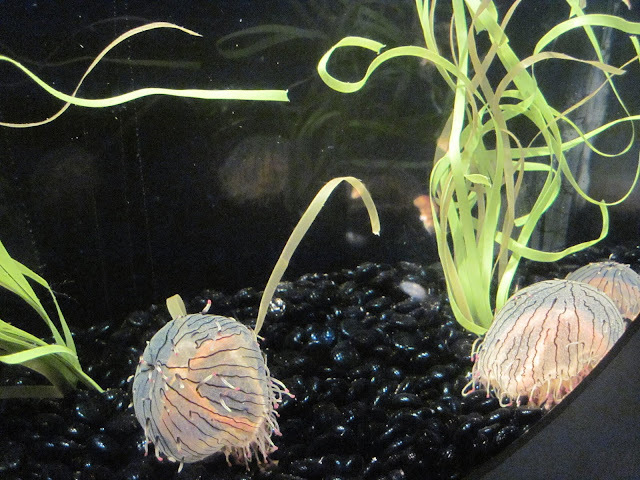 The Aquarium estimates that there are only about 430 individuals of this species still around. In the past they were hunted nearly to extinction for their meat and oil. In fact, the name right whale comes from the fact that they were considered the right whale to hunt, due to their slow movements and the fact that they float after they’re killed. Fortunately, they are now protected from whaling worldwide. However, they still face a lot of danger from boat collisions and entanglement in fishing gear. Definitely check out our Right Whale Research Blog for more information on what the Aquarium is doing to protect these majestic animals. Right whale researchers in the field. Our particular skeleton is about 35 ft long, so it was most likely a juvenile whale. Adult Northern right whales can grow between 45 and 55 ft in total length, and weigh up to 70 tons. A fascinating feature of the skeleton is the structure of its pectoral flippers. Looking at them, you can see that whales actually have five digits, like us. I think it’s just a cool reminder that we’re more similar to other animals than we sometimes realize. Notice the five digits of the North Atlantic right whale’s flipper. As I mentioned earlier, this skeleton is not quite complete. One thing people don’t always realize is that whales’ ancestors lived on land. As competition intensified on land, some mammals adapted once again to the ocean to take advantage of unused food resources. Some marine mammals, like our fur seals and harbor seals, still have both front and hind legs, but whales don't. However, while whales don’t have any usable hind limbs, many do have tiny pelvic bones embedded in muscle. Bones or organs that are present but no longer seem to be of much, or any, use to an animal are known as vestigial (one of my favorite words!). An example in humans would be our wisdom teeth. With our right whale skeleton these vestigial pelvic bones are not present, but would be floating somewhere between the ribs and the tip of the tail. In this diagram, the letter C indicates the vestigial hind limbs of a whale. So next time you’re at the Aquarium, don’t forget to look up! There are more than just tanks to explore when you’re here.